Ironically, his threat became his contribution to Philippine Chavacano. Koxinga (Zheng Chenggong) was the first Han Chinese leader to hold political power in the history of Taiwan. Although he died less than a year after his arrival in Taiwan, and the rule of the Cheng family lasted only 12 years, Koxinga was not categorized as a roving bandit because of political failure. On the contrary, in Taiwanese folk legend, his every action and interaction with others has been depicted as that of a saint or a sage, and temples have been consecrated to him all over Taiwan. The people of Taiwan see Koxinga as the original ancestor who developed Taiwan. This week, we have invited Professor Tai Pao-tsun from the history department at National Central University to tell us about this legendary figure in Taiwanese history. 340 years ago, on April 30, 1661, Koxinga lead armed forces ashore to Luerhmen, Tainan, and besieged the Dutch for nine months, and then forced them out of Taiwan, which they had ruled for 38 years. Koxinga wanted to use Taiwan as a base for his resistance against the Qing empire, but in 1662, he suddenly fell ill and died, and his kingdom of Tung-ning was inherited by his son, Zheng Qing, and then by the third generation, his grandson, Zheng Keshuang, who was defeated and overthrown in 1683 by a Qing general named Shi Lang. Although Koxinga's time in Taiwan was short, he left behind many stories and legends. Zheng Chenggong's (1624-1662) hometown was Nan'an, in Quanzhou, Fujian, and his father, Zheng Zhilong (1600-1661) was a maritime merchant and pirate, who in 1622 came to Peikang in Taiwan with Yan Siqi, and often went to Hirato in Japan to trade. As a consequence of this last connection, he married a Japanese woman by the name of Tamura Matsu. In 1624, Zheng Chenggong' was born. The coastal area where he was born still has a relic called the "childbirth stone." Zheng Chenggong''s mother, Tamura, raised him on her own until he was seven, and had great influence on the development of his personality. In 1630, Zheng Zhilong took him back to Nan'an for his education. Because women were forbidden from leaving Japan, Tamura was unable to accompany him. Zheng Zhilong engaged Confucian scholars to educate Zheng Chenggong, so that he might be able to pass the imperial examinations. The origin of the name "Koxinga"
Zheng Zhilong did not put his heart and soul into helping Prince Tang resist the Qing, instead he used his position and achievements to throw his weight around, and in 1646, the Qing army attacked Fujian and Prince Tang was taken prisoner and died. Zheng Zhilong saw that the Southern Ming had no way of succeeding, and surrendered to the Qing court. Koxinga had argued long and hard with his father, but it was impossible to get him to change his opportunistic behavior, and in the end they parted company, each going his own way. Not long afterwards, Qing troops attacked Nan'an. Koxinga's mother Tamura, from whom he had been separated for more than 10 years, finally came over from Hirato, but was raped and killed, which made Koxinga all the more implacable and bent on revenge towards the Qing court. Thereupon, taking Xiamen and Jinmen (Amoy and Quemoy) as his bases, he supported Prince Gui (Emperor Yongli), received from him the title of "Prince of Yanping Prefecture," and waged war against the Qing army in the coastal regions of Fujian, Guangdong and Zhejiang. In May 1658, Koxinga commanded 170,000 amphibious troops on a campaign to the north, and planned to attack Nanjing, but because he was unable collaborate with Zhang Huangyan from the Yangtze River Basin and wage war with full force, the Qing army defended the city and prevented war. Koxinga's army did not have enough food to feed itself, so ultimately Koxinga did not attack Nanjing but instead returned to Xiamen. Koxinga thought that with only Xiamen and Jinmen, it would be difficult to resist the Qing in the long term, and on top of this, the Qing court was using a policy of banning maritime trade, which blocked financial resources from trading for Koxinga's army. Koxinga's family had traded with the Dutch in Taiwan in the past, and a man named He Bin, who worked for the Dutch in Taiwan, had come to Xiamen to seek shelter. He Bin apprised Koxinga of the military situation in Tainan, and gave him information about the geographical topography, whereupon Koxinga accepted military staff office Chen Yonghua's suggestion that he mobilize his army to capture Taiwan. In April 1661, Koxinga led around 400 warships and 25,000 troops from Xiamen via Penghu (the Pescadores) to attack Taiwan, and in the morning of April 30, Koxinga's army landed at what is now Luerhmen in Tainan. Folk legend tells that before Koxinga came ashore, because they had run out of food, and since sandbanks were making it difficult to come to shore, Koxinga stood on the bow of his ship and burned incense to Matzu. As a result, the tide swelled and Koxinga's army was able to come ashore smoothly. Later on, Koxinga built a temple which he dedicated to Matzu on the spot where he had landed. The topography of the coast at Tainan has changed dramatically, so although Tuchengtsu and Hsienkungli, to the south both have large Matzu temples with long histories, which of them is genuinely at the spot where Koxinga came ashore has long been a topic of debate. After Koxinga's troops landed, they immediately besieged the Dutch, and after numerous attacks, defenses and exchanges of written communication, at the end of January 1662, the Dutch resolved to negotiate and surrender. On February 1, both sides signed a treaty. The Dutch left the goods and property behind at Fort Zeelandia, but all officials, soldiers and ordinary people were free to leave Taiwan, with their personal belongings and supplies. 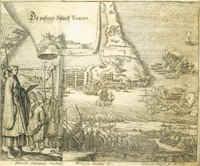 On February 9, the last Dutch governor, Frederick Coijett, handed over the keys to the fort, and led two thousand people back, by sea, to Batavia (modern-day Jakarta), thereby ending 38 years of Dutch colonial rule in Taiwan, and formally establishing the first Han Chinese political rule in the history of Taiwan. The Dutch left Taiwan at the beginning of February, and Koxinga died at the end of June. There are many different explanations concerning his death, some say that it was because of his defeat at Nanjing in 1658, at the beginning of 1662, Prince Gui was betrayed by Wu Sangui, taken prisoner and killed, or because Koxinga's personality was harsh, and he was severe with his inferiors, and so many of his army deserted him. There is also the explanation that a false rumor reached the Philippines, that Koxinga was going to invade and take the Philippines, and local Chinese were acting as plants, which brought about a tragic massacre of Chinese people by the Spanish, and this made it hard for Koxinga to put his mind at rest. There's also the fact that his father, Zheng Zhilong, was sent into exile in the northeast, because his son had rebelled against the Qing, and at the end of 1661, he was put to death in Beijing, and the Qing court even sent people to desecrate his family's ancestral graves, all of which made Koxinga extremely upset and indignant. After Koxinga arrived in Taiwan, he left his eldest son, Zheng Jing, to guard Xiamen. Zheng Jing had an affair with his younger brother's wet nurse, a woman by the name of Chen, and this liaison produced a son. Koxinga was furious, and considered this behavior unpardonable, and he ordered an officer to go to Xiamen and kill this child. The officer unexpectedly disobeyed these orders, causing Koxinga great distress and anger, with the result that he fell ill and died. In actual fact, the real cause of his death was most likely contraction of malaria, because the Taiwan of those days was rife with contagious diseases, and malaria claimed countless lives. Koxinga died in his prime, and malaria must have been the fateful hand of death which took his life. The other stories described above are simply the exaggerated legends of a folk hero. Koxinga has become a sanctified historical figure in Taiwan, and so many legends concerning him abound in different places. For instance, fish and snails that Koxinga ate are called "Koxing-fish" and "Koxing-snails," and there is a village in Nantou called "Kuohshing Hsiang" ("Koxing-Village"). In Tsaotun Township, Taichung County, legend tells that Koxinga's army passed through that place, and rested a while there because of rain, and the mud which they shook off their straw shoes piled up to become the Straw Shoe Mound. At Tachiah in Taichung, there is a hill called Anvil Hill, with a well called the Sword Well. Legend says that Koxinga's army passed by, in need of drinking water, and Koxinga used the point of his sword to pierce open a well, from which sweet water gushed forth. In Ying-ko, in Taipei County, there is the Ying-ko Rock. The story behind this is that Koxinga's army passed through this place, where there was an old eagle who made mischief. The eagle was shot by a cannon and was turned into stone, and became the "Eagle Hill" in Sanhsia. In Keelung there is a Fairy Cave where, so the story goes, rice flowed out of the cave to feed Koxinga's army, but the soldiers became lazy and dug deeper into the cave, and the rice stopped flowing out. These tales reflect the fact that it was Koxinga who brought the Han Chinese to Taiwan, and Taiwanese people still see Koxinga as the original ancestor who opened up Taiwan, which is why he is known as the "sage king who opened up Taiwan," and worshiped as a deity. Taiwan has a total of 63 temples devoted to this "sage king," the most representative of which is Tainan's "Shrine of the Prince of Yanping Prefecture."